a group of Russian Orthodox faithful set out from Mayfield, Pennsylvania. Some rode by train, buggy, or wagon, but many simply walked, crossing over Mt. Salem to a common meeting place in Waymart. Once everyone had gathered, the procession then continued on foot to the little village of South Canaan and the sacred grounds of the newly-founded St. Tikhon’s Monastery. Patriarch Tikhon—now St. Tikhon of Moscow, the Monastery’s founder—along with the Monastery’s first Abbot, Fr. Arseny, led the procession. This was the first Memorial Day Pilgrimage. 114 years later, St. Tikhon’s Monastery, nestled amongst the rolling hills and farms of the Pocono Mountain region, remains a beating heart for Orthodox faithful in America. 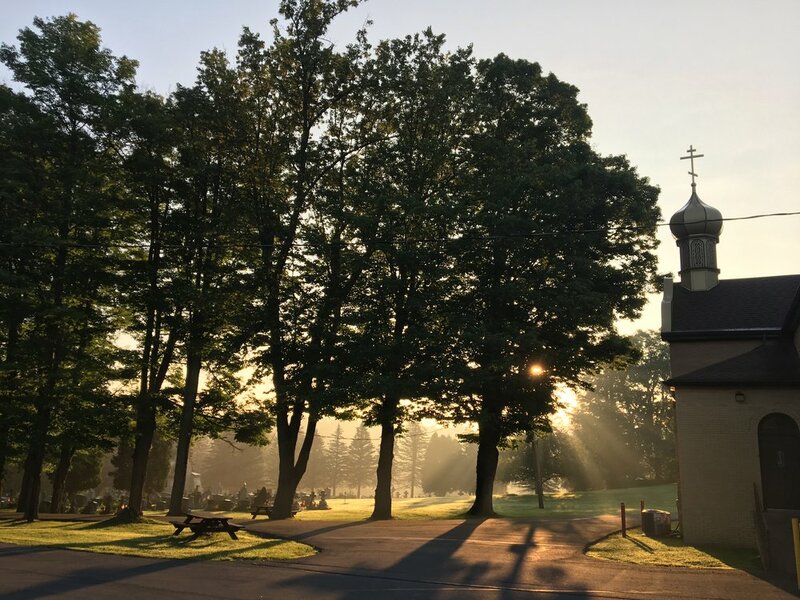 Year after year, in accordance with our founder St. Tikhon’s wishes, pilgrims have returned each Memorial Day weekend to these grounds “where saints have walked” as a means of reconnecting with God and the spiritual tradition of the Orthodox Church. They attend the rich and festive services, meet old friends and make new ones, enjoy time with family, take in a spiritual word from one of the fathers of the Monastery, receive comfort for souls burdened with the cares of this life, and remember loved ones who have departed to the next. This year’s 115th Annual Memorial Day Pilgrimage continues the tradition laid down by St. Tikhon and Fr. Arseny. It will be especially graced, once again, by the presence of the myrrh-streaming Hawaiian Iveron Icon of the Mother of God, as well as by the presence of numerous hierarchs, clergy, faithful, and friends of the Orthodox Church in this land. Come, pilgrim, and walk in the footsteps of the Saints! Learn about our schedule of services and events for this, our 115th Annual Memorial Day Pilgrimage. Do you love church singing? Do you want to deepen your understanding? Do you want to sing with world class singers? Register today for the 2019 St. Tikhon’s Choir Festival. Join us for the premiere performance of Benedict Sheehan’s Liturgy of St. John Chrysostom, at St. Stephen’s Cathedral in Wilkes-Barre, Pennsylvania. Find hotels, B&Bs, and rentals for your stay during the pilgrimage. Find out about local amenities and meet our neighbors. Sign up with your email address to receive news and updates about St. Tikhon’s Memorial Day Pilgrimage and other events.